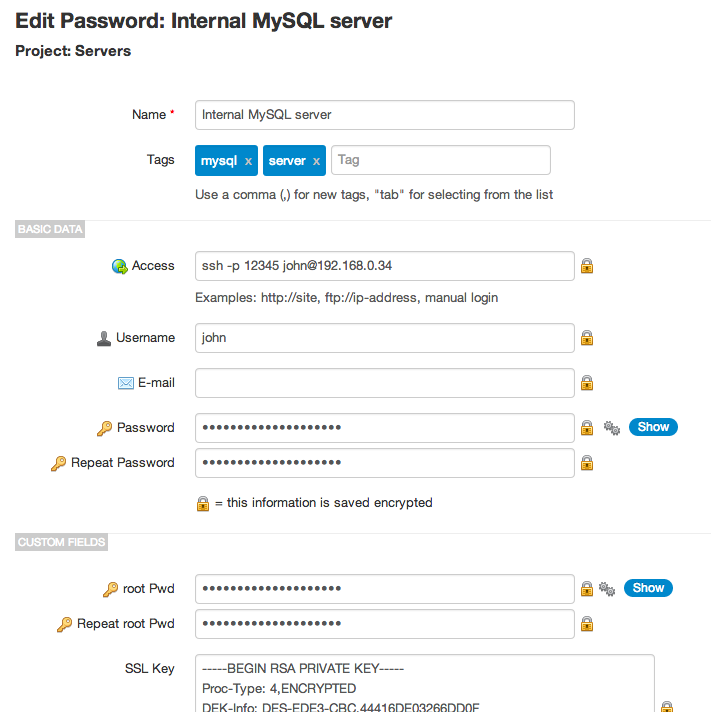 Beginning with version 2.25.45 you can add up to 10 custom fields to a password. You want to do this if your password needs more data besides the usual access, username, e-mail and password fields, or even if you want to group several passwords into one unit. Text fields contain strings up to 250 characters and are saved unencrypted in the database. They're usually used to store non-critical information. The "phpMyAdmin URL" in the previous example is of type text. Text fields are also searchable using the password search feature. Encrypted text fields are like text fields (strings up to 250 characters) but are saved encrypted in the database. They're used to store critical information, but not passwords (you have a special type for this). Because they're stored encrypted you won't be able to search for their content. E-mail custom fields are only used to store e-mail addresses. When editing data, a validation function ensures that only e-mail addresses are entered in these fields. Since they're stored unencrypted, the password search feature will be able to find their content. When viewing data they also behave like regular password fields: they're hidden by default, when shown using the "Show" button the action is logged and they can be copied to the clipboard (which is logged too). Password custom fields are not searchable. Notes fields can contain large amounts of text and they're stored unencrypted. Use them to store instructions or any other text that doesn't fit inside a text field. Encrypted notes fields are like the notes fields but they're stored encrypted in the database. They're used to store critical text larger than 250 characters, like for example SSH keyfiles (you could also upload them in this case), license data, etc. Encrypted notes fields are not searchable. Note: only users allowed to edit the password can edit custom fields configuration. 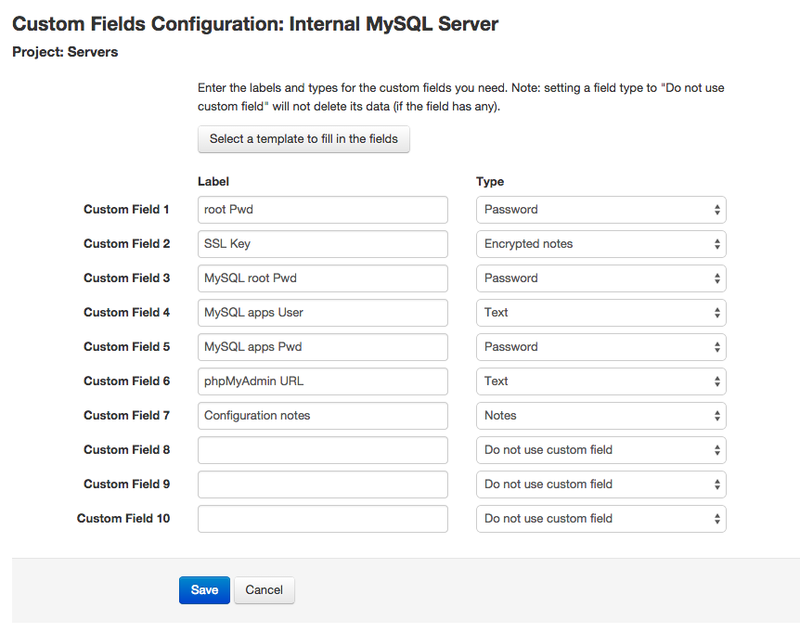 In this screen you have a label and a type for each of the 10 custom fields. To define a custom field, enter its label and choose a type. If you don't want to use a custom field anymore, delete its label and set its type to "Do not use custom field". Note that this will not delete the field data if it has any. Beginning with version 4.41.83 you can define custom fields from a template. Go read the Custom field templates document to learn how to do so. If you delete the definition of a custom field (delete its label and set its type to "Do not use custom field") but it still has data, these data won't be deleted. The field will be converted to type "Text" and the label will be "Custom". When the data for the field are deleted, the field will entirely disappear. If you change a field's type from an unencrypted type to an encrypted type, like for instance from "Text" to "Encrypted text", the field's data will be encrypted and re-saved, but it will not change. The same will happen, but in reverse, if you change its type from an encrypted one to an unencrypted one. Custom fields can be exported/imported as unencrypted text. Please see the Export and import passwords document for more information.